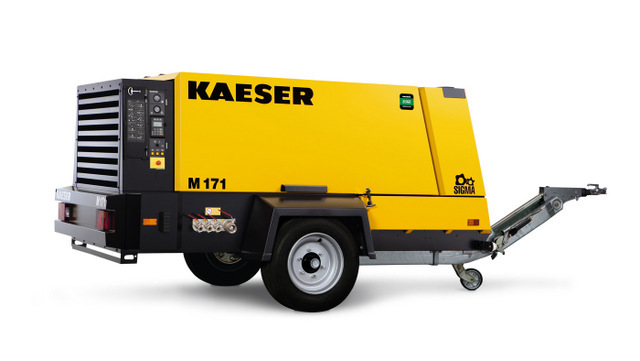 Kaeser‘s new Mobilair portable compressor delivers 405 to 600 cfm in variable pressures. With many rugged, durable features, it is ideal for heavy-duty civil and commercial construction, demolition, sand blasting and other site work applications. The M171 comes standard with the Sigma Control Mobil controller which provides variable pressure ranges between 85 and 205 psig to power breakers, cable blowing and even high pressure applications. The controller also prevents improper shut-down, ensures machine-friendly start/stop operation and provides alerts for upcoming maintenance. The M171 includes an easy-to-read but well-protected control panel, large-neck fuel tank with overflow protection. The heavy-duty steel chassis, galvanized steel canopy and solid steel flooring protect the Deutz diesel engine, Sigma Profile airend and motor. While the rugged tool bar and oversized tires allow for superior road handling. The high capacity, cold-start battery ensures reliable operation even under extreme weather conditions. Plus, the excellent cooling features allow the M171 to operate in temperatures up to 122°F. For more information on Kaeser, click this link. You can do it. Click!